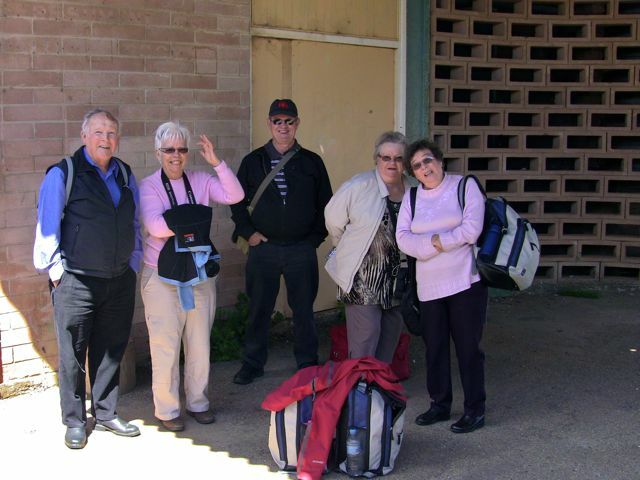 Last October we flew to Perth and joined a coach tour of W.A. 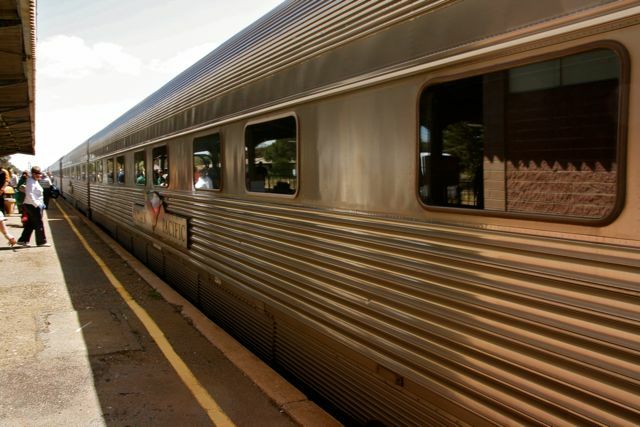 Then we flew to Adelaide and hired a car with friends and travelled around S.A. We returned to Adelaide and then we were to catch the Indian Pacific Train from Adelaide to Sydney. When we arrived at Adelaide station we were told that there had been a train derailment and The Indian Pacific Train couldn't get into Adelaide. So we were taken by bus to Peterborough a 2 hour trip north, where we had been sight seeing a few days before. We were waiting on Peterborough Station while the train was serviced. It has come all the way from Perth on the Indian Coast and it goes across Australia via Adelaide to Sydney on the Pacific Coast. It takes 3 days and nights to travel the 4,352 km. 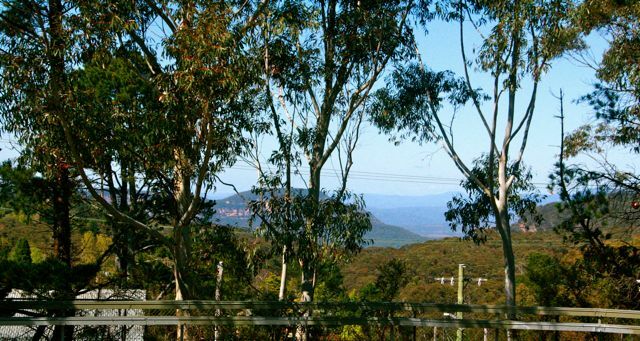 Ann and George have done this whole trip but the rest of us were going to trial the shorter 2 day, 1night trip from Adelaide to Sydney. The train has 16 cars and is 427 m long. At first we travelled through desert. While we were at dinner the crew converted our cabin into a sleeper. However, we didn't find it easy to sleep as the train rocked about a bit too much. 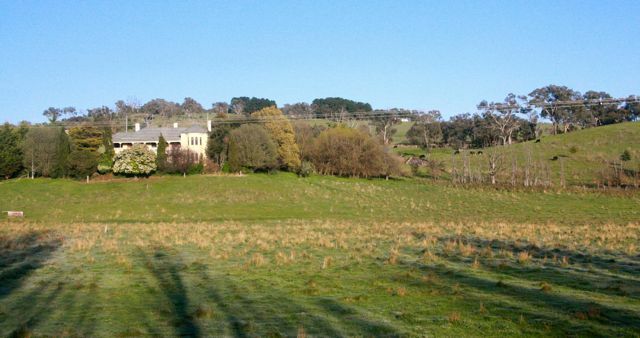 In the morning the scenery had changed to farmland. We climbed over the beautiful Blue Mountains into Sydney about lunchtime. The diesel engine went in backwards to terminate at Central Station. 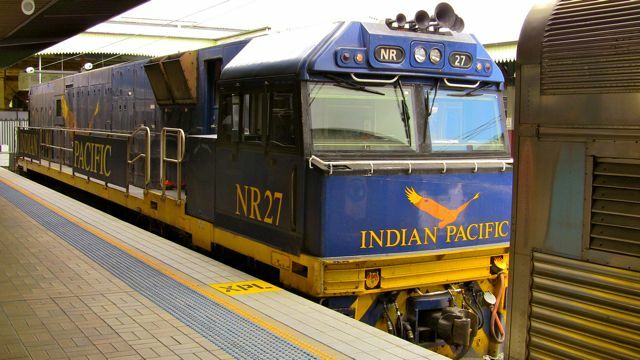 The symbol of the Indian Pacific Train is the Wedge-tail Eagle. Australia's largest eagle. Its massive 2 m wing span symbolises the train spanning the continent. The en-suite on board was extremely tiny and I was looking forward to a nice warm shower and a change of clothes. We said good bye to our friends who were flying home to Brisbane. We were going to our daughter and SIL's for a few days before flying home. Bill loves trains and he was keen to try out this famous Aussie train. I warned him not to expect it to be as good as the super European trains that he was used to in Switzerland and Europe. We enjoyed the experience but we wouldn't like to do the 3 day trip across the country. Take a minute's train trip with us on Bill's short video. Hi Diane, this sounds like a fun trip. I have not been on a train overnight, I would have trouble sleeping too. The scenery of the countryside is pretty! Wonderful photos and memories of your trip. Happy Sunday or is it Happy Monday there? 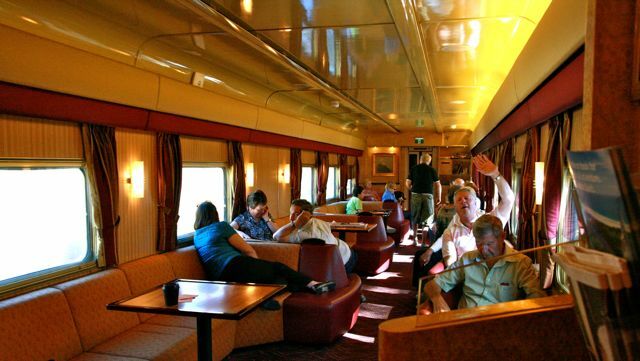 The dining car looks comfortable and classy. We never went on holiday by train except a sleep train to move from one place to the other. Hmmmm. Hadn't thought about a train trip. Looks like a nice ride. The scenery sure was pretty. Trains are an adventure all by themselves I think. I once took a 3-day train trip from Los Angeles to New Orleans, but could not afford the sleeper, so tried to sleep in my coach seat. I had two teenagers traveling with me also. Not fun at all! Wouldn't mind trying a cross country trip with a sleeper car however, at least once in my life. This sounds like fun but I think I would have had trouble sleeping on them too. I've never been on a train in the US but traveled by them a lot when I lived in the UK. What fun! LOVED the video and thanks for the short ride. Pity the train was so good for sleeping. Do you think it was because of poor track or it being an old train? We travelled overnight in a train in Vietnam and it was very smooth but very very noisy at speed. I have subsequently learnt that the problem is corrugated rail that needs to be ground flat. It was some time ago, so maybe it is better now. I'd love to ride a sleeper train, just for the experience (preferably the Orient Express- ha!). In this country you'd be at the other end of the land by morning! Andrew, the problem with the Indian-Pacific is the track. Many years lying in the hot sun has probably buckled the rail tracks, as a consequence the train shakes and rattles it is difficult to have a drink in the dining room without spilling half onto the table or down your shirt. Sleeping wa impossible. I honestly can't understand that people can do this for 3 days and 3 nights. One was quite enough for me. The carriages are old but reasonably comfortable. The food was good. Well, first Bill is absolutely correct regarding the heat stress on the rail lines. I was only informed this morning of this by the local station master here regarding the late running of trains due to the rain. The traction for the wheels don't work as well and heat buckles the rail lines! 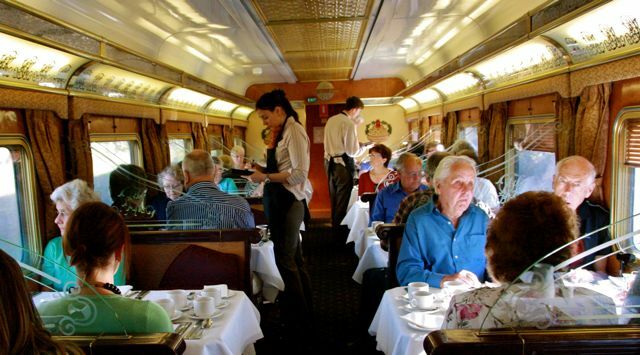 I am a bit disappointed with the dining and lounge cars, certainly not "the Orient Express"! So if you think that was bad, then don't travel on the Sunlander to Cairns - it would be a nightmare experience. My first class cabin was so small that even a cat would not have fitted in with me. The "exotic" train that was the replacement, the so-called "Pacific Orient" or some such name, based on the original Orient Express is now rotting in the railway yards of Ipswich! The cost in building these carriages was exorbitant. When I was much younger I loved taking the Overland from Melbourne to Adelaide. The steady clickety clack always induced a really deep and refreshing sleep. Since then, the gaps in the rails have been closed up, eliminating the noise that was a big part of the treat. This, I think someone told me, has been the cause of the rails buckling, as there is no longer room for them to contract and expand as the weather fluctuates. But... I love riding on any train except our suburban network here. I had a friend who did the three day Ghan trip and he said, 'never again'. Just too uncomfortable with no sleep and sitting down for that long. Then again, he did love the scenery though and ticked off another item on his bucket list. Oh wow! How I loved trains. I even loved sleeping on them although you're right - it was hard to do in ways. I had a compartment a few times. I've toyed with training (new word?) to DC to see my kids but it is incredibly expensive. Much more than planes now. So sad. America pulled up nearly all the rails in the country when planes came into being. What a stupid thing they did. I love travelling by train ! and especially old once ! What a nice trip that was ! Nice trip! The train looks like one of the elegant ones from earlier times -- very nice. I loved Bill's video, very professional! Looks like you all enjoyed your trip, even if it was too bumpy to sleep!!!! I only time I was on a train overnight was my 8th grade school trip to Washington, DC. We caught the train about 10pm and rode all night. It was exciting to be with classmates and I don't even recall sleeping at all. Walked around DC all day and rode the train back home that night. I'm glad you enjoyed your experience even without a lot of sleep. Not much room in there, however, a good experience I imagine. I'm jealous. We absolutely intend to do this trip one day and we say so every time we see it crossing the mountains. Loved the photos of the train journey. My overnight experience of a train was from Beijing tp Xian in China. Quite an experience especially when you share a cabin with people you don't know who happen to snore! What a fun an adventure! (Even if it wasn't the most comfortable ride.) My most fascinating train adventure was the year I turned 16, and my family and I took an EARLY morning train (not a tourist train) along with the native Peruvians and their chickens and pigs and other assorted animals, up the Urubamba River valley from Cuzco to Machu Picchu. A trip I will never forget! 20 short years ago when I was about 5 (joke! It was WAAAAY longer ago than that!) 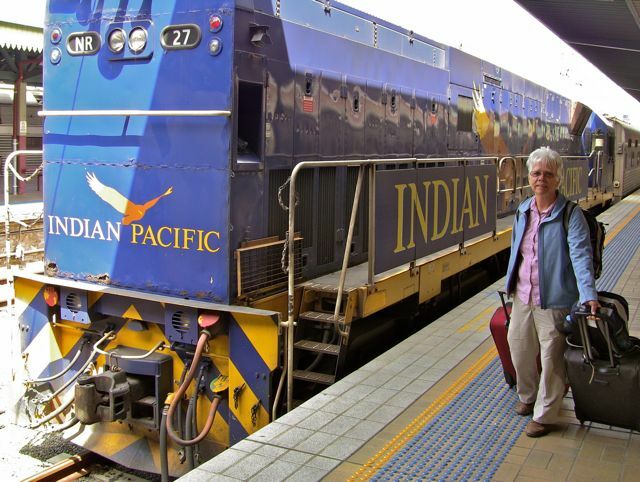 we travelled on the Indian Pacific from Sydney to Perth. As a child it seemed like a glorious adventure and one day I'll do it again to either prove or disprove that theory!! Did enjoy the long version of the train ride, in retrospect. Sleepers are being replaced with concrete ones so NEXT TIME Bill will enjoy it better. Have heard honey-mooning men enjoy it! I loved the video! 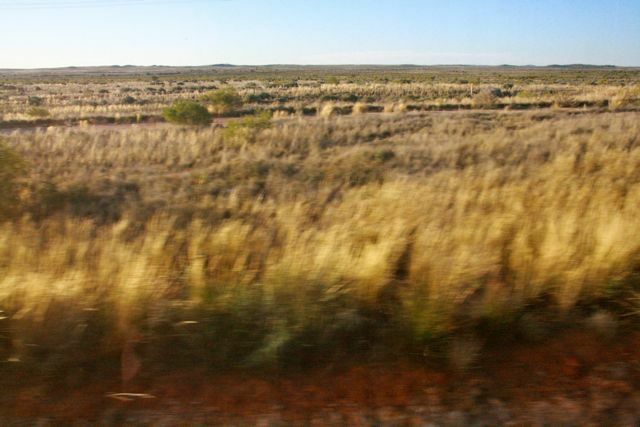 One of my fondest wishes is that when I (finally) make it to Australia I'll be able to take The Ghan. I'm not sure when this will happen, but happen it will! Thanks for sharing your adventures with us. It's fun to "travel" with you. Love experiencing your adventures through the wonderful photos! The train must have been interesting, but tiring... I agree... one overnight was enough. Pretty train! I love the sculptures at the Mall! Have a lovely visit with family! Hi Diane, I've been back several times now and my silly computer (satellite) will not bring up your youtube or half your photos. I'm going to comment anyway from what I can upload! I enjoyed Bill's video and I could see how the train had a lot of vibration thta must have made it difficult to sleep soundly. The ride looks interesting --much easier than driving a car!